Schorger, who died in 1972, was a paper chemist before starting a career of research and writing. A friend and major contributor to the arc of AldoLeopold’s career, Schorger is well known in conservation circles for an award-winning 1955 book on the passenger pigeon. Those interested in Sorger’s work wouldn’t have to go farther than UWSP’s Museum of Natural History, where an exhibit on those birds can be found, as Gazette writer Ken Blomberg noted recently. Meyer was DNR secretary for 10 years before retiring in 2002 to take over the wildlife federation’s state office. His support of science-based policies is sorely missed in today’s DNR, and even though the federation has made its mistakes in my opinion – such as supporting the state’s concealed-carry law – it has fought diligently to maintain access to public lands on multiple fronts, among other needed efforts. Because of their writing, my favorites among this year’s inductees are the Lukes. Sadly, Roy passed away in June 2016, but Charlotte, the “partner in nature” who married Roy in 1972, carries on the legacy. They received numerous awards from nature-related groups over the years, largely for advocacy work which took multiple forms. A teacher by profession, Roy became the summer naturalist at the Ridges Sanctuary in Baileys Harbor in 1964. 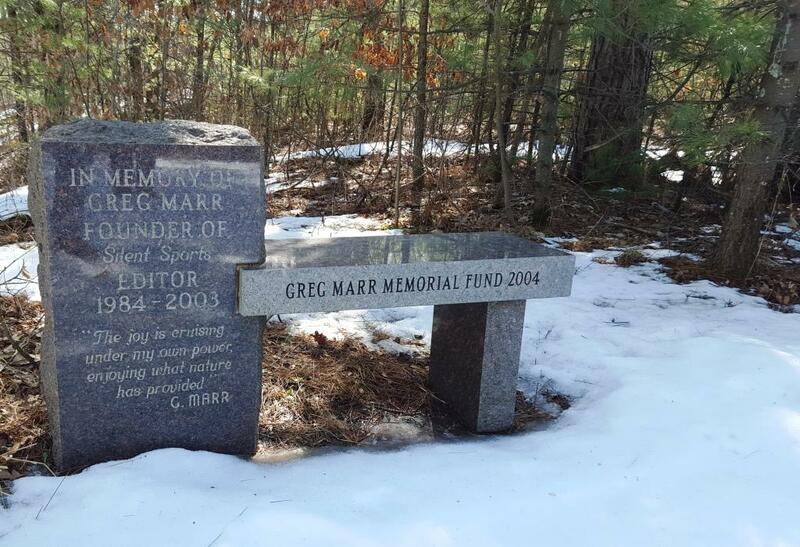 He met Charlotte – a mycologist who catalogued 596 species of Door County mushrooms – on a hike, and they continued leading classes, hikes and other programs together until Roy’s death. Roy wrote five books and more than 3,000 newspaper articles and columns, many still housed on the Door County Pulse website, providing inspirational, enlightening reading on the nature of the peninsula. Attending the ceremony on April 14 is a great way to honor all of these Wisconsin heroes. A luncheon afterward starts at 12:30 ($25, with reservations available here). Regardless, take a few moments outdoors to reflect on the work that these folks and others have done to keep nature healthy and available to all. And on that note, it’s back to that big guy we saw on the New Hope-Iola Ski Hill segment of the Ice Age Trail recently. I’ve just passed the 200-mile mark on my quest to hike the entire Ice Age Trail, which I began seriously a little more than a year ago. That figure includes a mile of “tread,” or standard trail, through forest and meadow at the Iola Winter Sports Club’s cross-country and ski-jump facility west of Iola, plus 7 miles of roads leading there. The miles came over two days with hiking buddy Chris Sadler. The road miles, which started at a boat launch at Waupaca County’s Brekk Lake, wound north to the ski hill and were surprisingly difficult, taking us a little more time than planned for various reasons. That was better, because we wanted to visit the Central Waters Brewing Co. taproom in Amherst, and we wouldn’t have been able to spend as long as we did on our return. 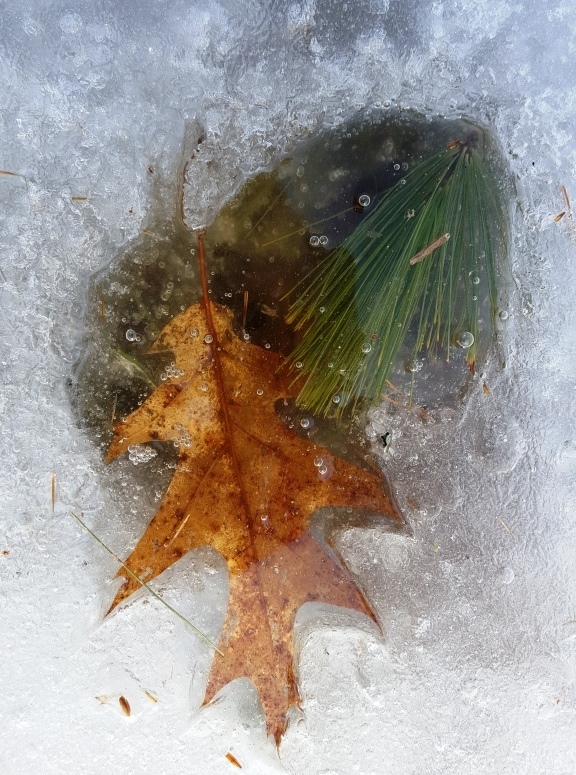 Our return trip was a short, Sunday-afternoon out-and-back hike starting on groomed cross-country trails. Melting snow and occasional ice made the hilly terrain more challenging, but the winding, broad, and apparently well-lit trails make the property look like a fantastic place to ski. 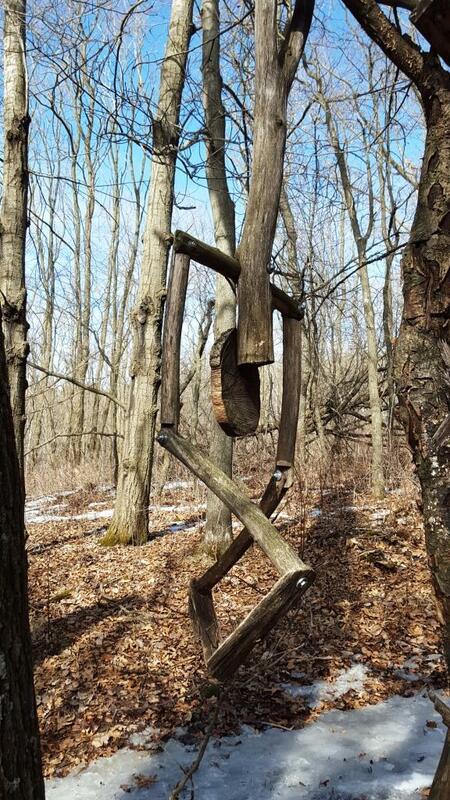 The property was certainly great for hiking, especially after the Ice Age departs from ski trails and wanders past several whimsical wooden figures we saw standing in a meadow, perched on a downed trunk and hanging from a branch on a wooded hillside. 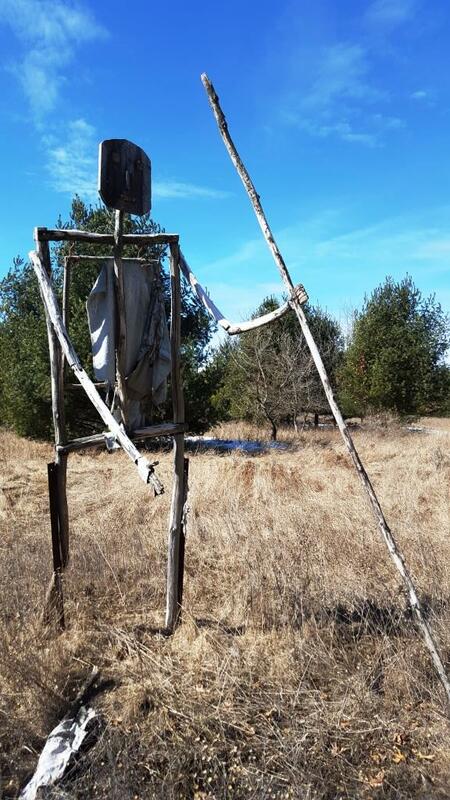 Made of branches and other chunks of wood, a few nuts and bolts, and some cloth, the figures provided extra entertainment on a sunny but chilly day. They’re curious characters – especially the largest, which looms about eight feet over the meadow. I haven’t located any info on them, as they’re not noted in the official trail guidebook and an internet search turned up only a brief reference in a 2017 Midwest Living guide to the trail. No matter what their story, they’re worth a visit and a toast, as are all of our guardians of Wisconsin’s great outdoors. This post originally appeared in the March 30, 2018, edition of The Portage County Gazette.